There are few things in the world I love more than this cookie. It features the best flavor combination known to mankind -- chocolate & peanut butter. AND it's simple to make. What could be better? Well, maybe eating it on a blanket underneath the Eiffel Tower while wearing a pair of Louboutins. That's about it. Bring saucepan ingredients to a full point for exactly one minute (over medium-high heat). Add contents of bowl to saucepan and add 1 tsp good vanilla extract. Mix well and spoon cookies onto wax paper to set. 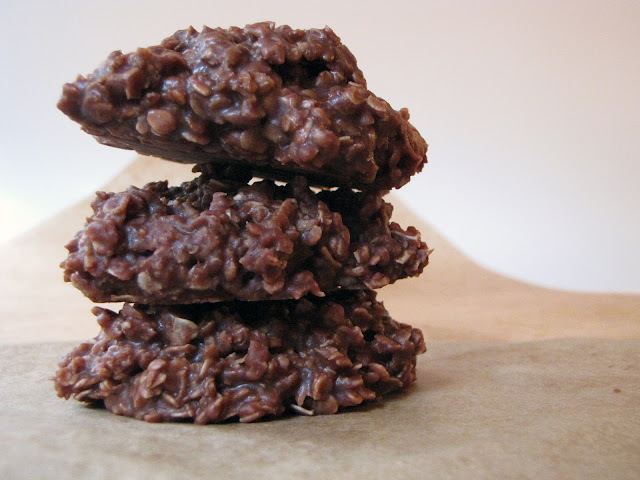 I LOVE no bake cookies! One of my favorites! yumm. love how simple this is. i am bookmarking this and going to try it!